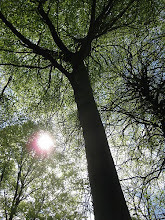 Beech leaves are emerging and woodland flowers must rush to take advantage of the light before the leaf canopy shades the ground. Bluebells have come into full bloom in the last week and wood garlic is just starting to flower. Primroses violets and wood anemones are all in flower so this is a particularly beautiful time in the woods so make the most of it and take a walk!